The Bharatiya Janata Party under its strategy of expansion in east and south India is betting on Kerala. The party finally managed to open its account in Kerala with veteran leader OP Rajagopal winning from Nemom in the 2016 Assembly elections. In another seat in Manjeshwar, it lost by a whisker – just 89 votes. The BJP-led NDA recorded 15% vote share, almost three times its 2011 tally. In many seats, the BJP managed to convert bipolar contest into triangular. Prime Minister Narendra Modi attacked the Pinarayi Vijayan-led CPM government at a BJP rally in Thrissur on January 25. He reassured the people of the state that the BJP would continue to uphold the religious and cultural traditions of Kerala, and spiritedly face the violence of the CPM. "For every bomb they throw on us, for every stone they hit at out workers, for each form of their violence, our resolve turns stronger to end their undemocratic rule," Modi said. He also exposed the hypocrisy of the Congress on the issue. Hindus account for 55% of the population and Muslims and Christians form 45%. Muslims and Christians have traditionally supported the Congress while Ezhavas and Dalits have backed the Left. The upper caste Nair vote has been split between the Congress and Left. The BJP’s entry has left both the Congress and Left worried, more so Left because the BJP’s target is Left vote blocks. Upper caste and OBCs are anchor voting segments of the BJP in North and West India. That is why we have witnessed bloody violence in the state where hundreds of BJP / RSS workers have been killed in the past decade. With the Left’s influence reducing drastically in Indian politics, it being out of power of Bengal and after having lost its fortress Tripura to the BJP, it is naturally worried. The people of the state who had no choice except to vote alternatively for the Left and Congress now have an alternative. Kerala has one of the highest minority population in India after Northeastern states and Jammu and Kashmir. It accounts for the highest Christian population (61 lakh), and sixth highest Muslim population (89 lakh) in the country. 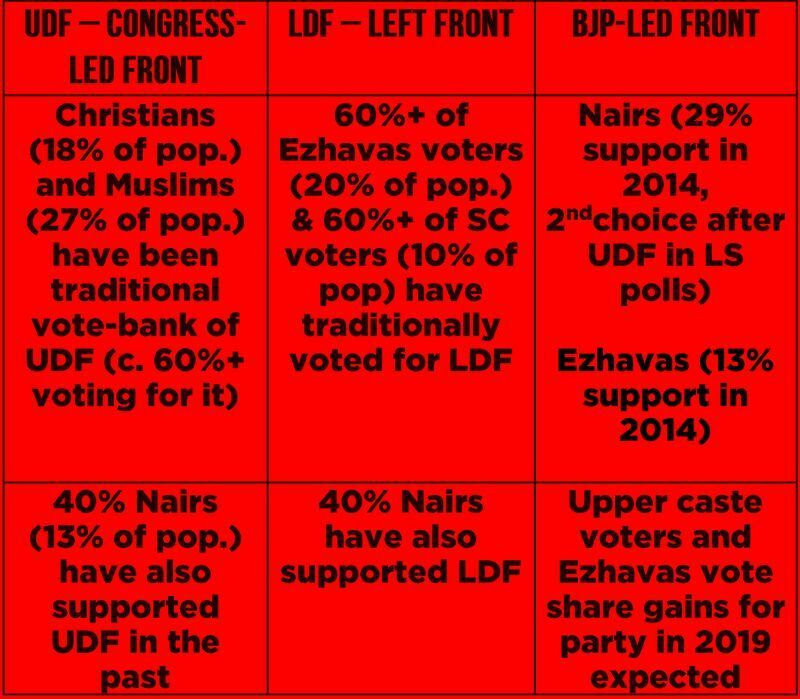 In the 2014 Lok Sabha polls, 64% of the UDF vote share and 39% of LDF vote share was accounted for by minorities’ support. In the past two elections, the BJP has expanded its voter base to impact both the Left as well as Congress. 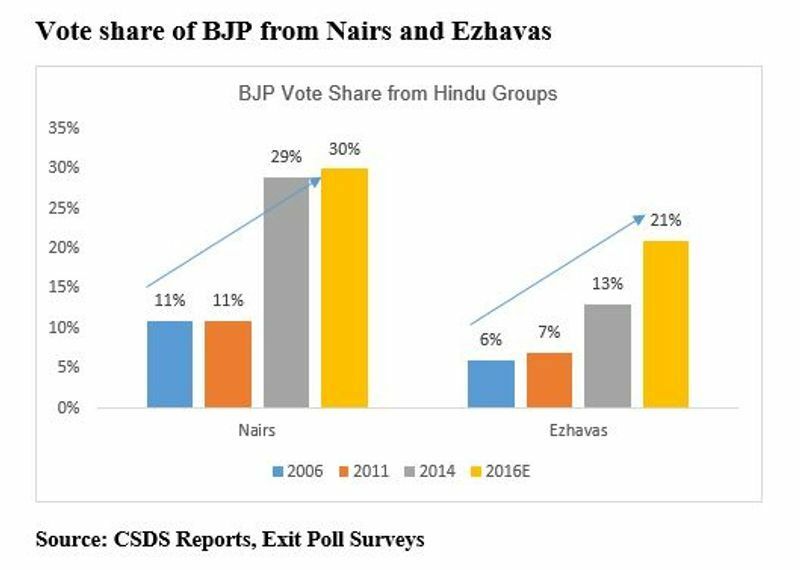 Around three-fourths of the BJP’s vote share came from Ezhavas and Nairs in 2014 and 2016. The BJP hopes that the Sabarimala issue could help it woo a larger number of Nair and Ezhavas votes from both the Congress and LDF significantly boosting its vote share. This could add another 10-15% to the BJP’s kitty. With a strong push for Dalits and strategy to woo Christian community in line with Goa, the BJP can reach the 25-30% mark which is enough to put it in contention given that 30% vote share in a tripartite environment can deliver numerous seats (30-40) for the BJP. The party became a force to reckon with in Karnataka by targeting urban voters, Lingayats, upper caste, and border districts. In Assam, its strong push on immigration issue helped consolidate the Hindu voters in favor of the majority. 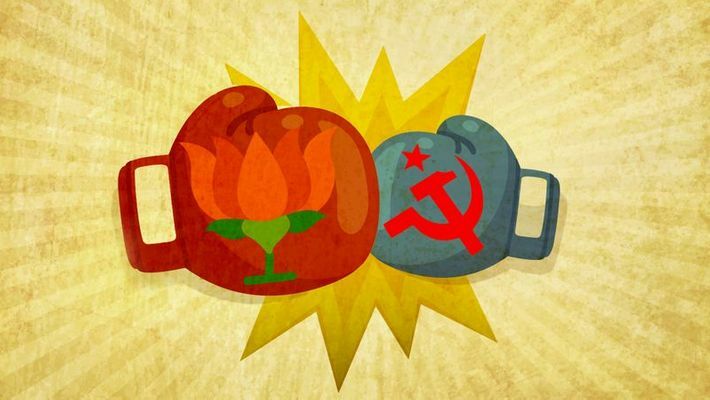 In Kerala, a strong push on Hindutva, re-iterating party is a natural claimant of this voting block, together with highlighting the anti-Hindu stance of Left parties nationally in other states, could help party wean away a large section of Left front voters over time. Modi in Thrissur rally thundered, “The conduct of Kerala's LDF government on Sabarimala issue will go down in history as one of the most shameful behaviour by any party and government. We knew that communists do not respect Indian history, culture, and spirituality but nobody imagined that they will have such hatred.” The Congress’s guarded stance and Rahul’s new statement that traditions should be respected shows that it also wants to walk on a balanced path on this tricky issue. The Left and Congress forged an alliance for Bengal and failed miserably. Can they come together in Kerala to thwart competition from the BJP? The Left didn’t attend the Mamata rally in Kolkata, but the Congress did. Any formal communists and Congress collaboration could spell trouble for both parties, especially Left, keeping the 2021 state polls in mind. With a strong trend of the public overthrowing incumbent governments, the BJP could push to make it a contest between the Congress and the saffron party in 2021. Even during the 2016 state elections, there were reports of under-the-table deals between the LDF and UDF to ensure the BJP doesn’t open its account in Kerala. This could be exploited by the BJP to the hilt to gain an advantage. The path to opening its account in 2019 is not all rosy and easy. The lack of strong leadership on the ground, issues with allies and its perception of Hindi heartland party pose challenges. Kerala is the most literate state in India, and the politics of polarisation has chances of backfiring as well, so it cannot be pushed beyond a certain level. Interesting times ahead.